Description: The 51 is eastbound from Emery to switch in Mason City. This is at the South Taft Avenue crossing. Description: Clear Lake Junction is the crossing and interchange with the C&NW. The 51 is pulling its train into the interchange track. Description: This was shot shortly after the IATR returned the Clear Lake line to service. For years, nothing had run due to washouts and track conditions. They are hauling in ethanol to the Williams facility in Clear Lake, having finished trackwork only a month before. Only reason I knew about this was work-I had been up interviewing with the track contractor a couple of months earlier. 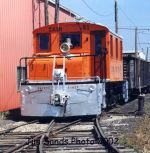 Description: One of four similar locomotives operated by the Iowa Traction, 51 poses in the railroad's yard at Emery on Aug. 19, 2004. Description: After doing some ballasting in Mason City, the Iowa Traction crew returns to Emery on the morning of Aug. 20, 2004. Description: Coming up on her 90th birthday, Iowa Traction 51 was built 5/21 as Northeastern Oklahoma 2, later became Crandic 57, Kansas City & Kaw Valley 505. Description: Built in May of 1921. Note that the swing coupler has been replaced. Compare to number 60. Description: Heavy action day with 3 (!) Steeple Caps on duty.